Pioneers in the industry, we offer polycom voicestation 300 analog conference phone, avaya b109 conference phone usb bluetooth speakerphone, avaya b149 analog conference phone, avaya b159 analog conference phone, konftel 300wx dect wireless conference phone with battery backup and grandstream audio conferencing system from India. 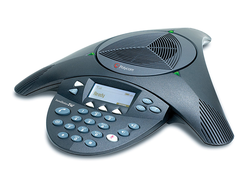 Polycom VoiceStation 300 is an analog conference phone. Connect the phone to your analog PBX or PSTN. Polycom Acoustic Clarity technology brings natural sound quality to your audio conferences, while the three built-in microphones offer a 360-degree pickup radius. 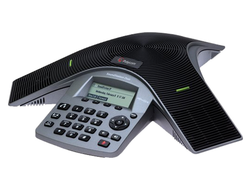 This conference phone is ideal for small groups of three or four, or individual use. The VoiceStation 300 conference phone blocks interference from wireless devices. Background noise reduction cleans up ambient sound from entering the phone. For more private conservations, the phone supports a pluggable handset. 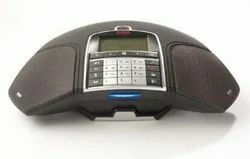 The Avaya B109 Conference Phone is a personal speakerphone. It’s is compact and portable and fits easily in your bag or briefcase, wherever you’re going. Despite its size the Avaya B109 Conference Phone delivers crystal-clear sound thanks to our unique Omnisound ® audio technology. The B109 Conference Phone can be used with Avaya Equinox and other conferencing applications on your mobile phone, tablet, or laptop. Expansion microphones extend Expansion microphones extend the voice pickup range from 320 to up to 750 sq ft (30-70 m2). Pickup range up to 30 m2 (320 sq ft),BELOW 10 people. 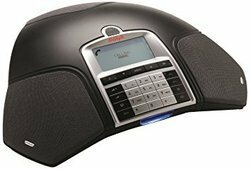 The Avaya B149 is an easy to use conference phone. Simply plug it into your analog phone system and a power outlet, then start the conference. This device is best in a moderately sized meeting room featuring around ten participants. Record conversations on the built-in DVR, with support for SD cards with up to 2GB capacity. Expand the Avaya B149 via available microphones and other accessories, enabling a conference of greater size and capacity. Loudspeakers volume 90 db SPL 0.5 m,150-7000 Hz. The Avaya B159 is an analog conference phone that delivers smart features to help conferences run smoother. You can record your conversations on SD memory cards and use the line mode to switch between and combine three connectivity technologies (analog, cell and USB). A conference guide allows you to make multi-party calls and save call groups, which can save a lot of time if you need to make calls frequently to the same group. The B159 Conference phone is designed for use in large conference rooms and boardrooms with over 10 participants on a call. The B159 can help improve productivity an collaboration between customers, colleagues and partners. OmniSound ® wideband via USB. The GAC25XX is an Android-based Business Conference Phone that will redefine the choices, flexibility and mobility available in any workplace. It supports up to 6 lines and 6 SIP accounts while also offering full access to the Google Play Store in order to hold conferences through Skype, Google Hangouts and more. The GAC2500 can also bridge calls from Android apps into SIP calls/conferences. 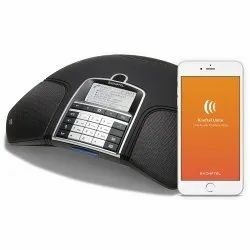 This Business Conference Phone offers a variety of mobility options by supporting Bluetooth for audio pairing and data syncing with mobile devices, as well as WiFi for wireless calling/conferencing in any location. A 7-way conference bridge allows the GAC2500 to easily create and hold a conference at any time and the 4.3” touch screen and familiar Android interface offers easy use. This Android Enterprise Conference Phone offers daisy chain support, which allows two GAC2500s to be daisy chained together in larger rooms or multiple rooms. The GAC2500 also features full HD audio, Gigabit ports, PoE, a built-in call scheduler and web browser. By combining all of these market-leading features, the GAC2500 offers a transformative foundation that gives any business the choice and flexibility to customize their conference phone based on their communication needs. The SoundStation IP 6000 features Polycom's HD voice technology, ensuring all conference calls are backed by unparalleled audio clarity. Set up this conference phone on a tabletop in a small to midsize meeting room, with a 12-foot microphone pickup radius. 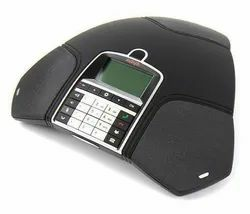 The Avaya B169 is a battery powered, wireless conference phone that can be connected to the DECT base station included in the package, to a mobile phone, or to a PC. The Avaya B179 conference phone features OmniSound 2.0 technology, bringing wideband audio performance to meetings. Deploy the phone in boardrooms or large meeting spaces, with a microphone pickup range of approximately 320 square feet. Through a web-based interface, contact lists and user profiles can be managed. Options for the Avaya B179 include a wireless headset connection and PA interface box. Also expand the conference phone with up to two expansion microphones, giving it a greater pickup range. These accessories are not included. A Android-based Business Conference Phone that will redefine the choices, flexibility and mobility available in any workplace. It supports up to 6 lines and 6 SIP accounts while also offering full access to the Google Play Store in order to hold conferences through Skype, Google Hangouts and more. It also offerd tremendous mobility and flexibility thanks to built-in Bluetooth, WiFi, 7-way conference bridge and much more. Grand stream GAC2500 is a VoIP conference phone with a beautiful 4.3" touchscreen LCD. It runs Android 4.4 KitKat, which means you can install apps on the GAC2500 and communicate via Google Hangouts, Skype, or other Android-based conference platforms. Grand stream's open standards philosophy led them to build in support for SIP, opening up many options for flexible integration with IP phone systems. The GAC2500 is an elite enterprise tool. Voices come in clearly due to its three cardioid microphones with a 12 foot pick-up radius and HD audio processing. It comes with WiFi and Bluetooth support for wireless communication, supports up to 6 line appearances, and has a 7-way conference bridge. It also offers daisy chain support with an included RJ48 cable. The Gigabit Ethernet switch port is auto-sensing, and allows you to power the conference phone via PoE+. Protocol Support: TCP/IP, UDP/IP, HTTP/HTTPS, etc. Dimensions: 11.02" x 11.22" x 2.36"
Patented acoustic technologies: Enterprise-grade audio quality lets everyone contribute and be heard in every conversation. Investment protection: Enjoy broad interoperability with both analog phones and today's leading IP telephony platforms, including Broadsoft, Microsoft Lync and Skype for Business. Specialized accessories: Quickly and easily customize your systems to meet your specific needs. Audio innovations: Constant improvement and innovation help you continuously enhance your audio experience. Analog Conference phones: The world's best-selling models deployed on the global public switched telephone network (PSTN). VoIP Conference phones – Models optimized to run on current and emerging IP networks. Microsoft Conference phones: The only group conferencing devices qualified for Skype for Business and Microsoft Lync deployments. USB Speakerphones: Simple, versatile solutions for communications on the go. 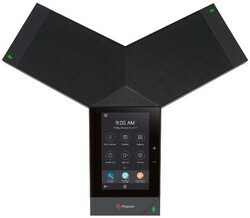 Polycom SoundStation2 conference phone features Acoustic Clarity technology, providing conference calls with crystal-clear audio quality. The three built-in microphones are designed to pickup audio from all around the meeting room, with a 360-degree pickup radius, while Dynamic Noise Reduction (DNR) stops background sounds from disrupting calls. The user interface on the Polycom SoundStation2 conference phone includes a display with softkeys, keypad and dedicated call buttons. Support for a Caller ID and a contact list offers more flexible calling and scheduling. The display promotes better collaboration and overall device management. An Applications Port provides a connection to smartphones, computers and other devices. Polycom SoundStation2 EX conference phone supports up to two expansion microphones. 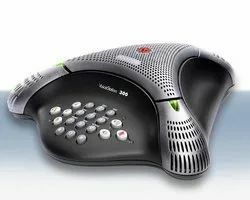 As is, the conference phone's three embedded microphones offer a 360-degree pickup radius with a range of up to ten feet away from the console. Acoustic Clarity technology facilitates more productive conference calls through crystal-clear audio, while Dynamic Noise Reduction removes distractions like background sounds and ambient audio. An Application Port lets you plug in additional audio sources, like smartphones and computers. The RCA auxiliary jack supports traditional 2.5mm plugs. 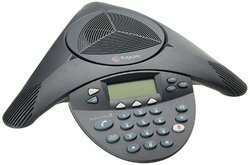 Easily interact with the Polycom SoundStation2 EX conference phone's user interface, including a display with three context-sensitive softkeys, a keypad and dedicated call buttons. View Caller ID and contacts through the display, or use the display to manage the device. Polycom SoundStation Duo features both an analog and IP connection. Operate this conference phone on your PSTN now, and then migrate it to a new VoIP network later. Or set up the conference phone to use the analog connection as a failover should the SIP-based network fail. Polycom's HD voice technology lets the SoundStation Duo deliver incredible audio quality, also featuring echo cancellation and background noise reduction. Deploy this conference phone in your small or midsize room. Let more participants join the conversation with available expansion microphones. The 2.5mm port supports mobile devices and computers. 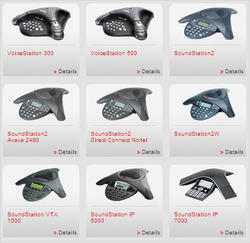 Polycom's HD voice technology enables the SoundStation IP 5000 phone to deliver crystal-clear, interactive conversations. Set up this phone in the middle of a small conference room, with a microphone pickup radius of approximately seven feet to cover the entire space. An ideal conference phone for turning an ordinary meeting room into an extraordinary one. Echo cancellation and background noise reduction clean up and refine the Polycom SoundStation IP 5000 conference phone's voice capabilities. A modern design and advanced audio performance boost this phone's overall attraction. The phone is also interoperable with SIP. Power the phone through a PoE-enabled network switch. The Polycom SoundStation IP 7000 conference phone supports Polycom's HD Voice technology, providing completely natural voice performance. No more straining to hear or understand conference participants. Set up this conference phone in a meeting room of any size, with the built-in microphone including a pickup range of up to 20 feet. For larger rooms or to support more participants, connect up to two SoundStation IP 7000 units together. Expansion microphones are also available, with up to two connectible to each unit. 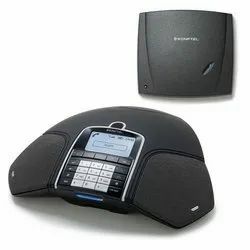 Integrate this conference phone with your existing SIP-based network, offering complete flexibility. Polycom Trio 8500 brings the legendary Polycom conference call experience to the midsize conference room. Polycom Trio 8500 is designed with a three cardioid microphone array, picking up voices in 360 Degree out to 14 feet. With Polycom's advanced audio technologies, including HD Voice, Acoustic Clarity, and NoiseBlock, you get the best conference call experience available for business today. For control, Polycom Trio 8500 has a bright 5" capacitive touchscreen, giving you an intuitive, smartphone-like UI. The Trio 8500 is more compact than the Trio 8800, perfect for smaller conference rooms, meeting rooms, and collaborative spaces. Dimensions14.02" x 12.17" x 2.76"
Polycom RealPresence Trio 8800 brings voice, video and content sharing together into one collaborative hub. Use the phone as an audio conferencing solution, with HD Voice and NoiseBlock technologies enhancing voice quality. Connect the conference phone to your network via Ethernet or WiFi. All of the phone's features can be accessed through the intuitive five-inch touchscreen, with additional microphone mute buttons located on each of the three arms. Bring your own device to the meeting with Bluetooth and USB. The Polycom Trio wirelessly connects to your smartphone or tablet via Bluetooth with NFC, or to a computer or laptop via USB. The available Trio Visual+ Accessory is required to enable the video and content sharing capabilities of the phone. With this accessory, the phone is able to access a camera and facilitate virtual collaboration. Optional expansion microphones are also available. The Konftel 300IP PoE is a flexible SIP-based PoE conference phone that is ideal for companies using VoIP telephony. The 300IP PoE is equipped with Konftels patented audio technology OmniSound 2.0 with wideband to ensure a clear and natural sound. 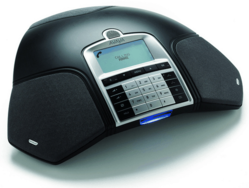 The Konftel 300IP PoE is a flexible SIP-based conference phone, perfect for companies that use IP voice services. Its clear, natural sound comes from OmniSound HD, Konftel's patented wideband audio technology. The stylishly designed 300IP PoE is packed with intelligent features for more efficient conference calls. Record and store meetings on a SD memory card. Use the conference guide to call pre-programmed groups with just a few simple pushes of a button. Conveniently import and export contact details via the Web interface. Create your own phone book with the personal user profile feature. The Konftel 300IP PoE is also ideal for larger conferences since it can accommodate expansion microphones, an external wireless headset and a PA system. With this Konftel conference phone your company will have a conference phone that combines all the benefits of IP voice service with innovative new features.